Not to be confused with Bono. Salvatore Phillip "Sonny" Bono (/ˈboʊnoʊ/; February 16, 1935 – January 5, 1998) was an American singer-songwriter, producer, actor, and politician who came to fame in partnership with his second wife Cher, as the popular singing duo Sonny & Cher. He was mayor of Palm Springs, California from 1988 to 1992, and the Republican congressman for California's 44th district from 1995 until his death in 1998. Bono was born in Detroit to Santo Bono (born in Montelepre, Palermo, Italy) and Zena "Jean" Bono (née La Valle). His mother called him "Sono" as a term of endearment, which evolved over time into "Sonny". Sonny was the youngest of three siblings; he had two sisters, Fran and Betty. The family moved to Inglewood, California when he was seven, and his parents divorced soon afterwards. Bono decided early in life to become part of the music business, and began writing songs as a teenager. "Koko Joe", a song he wrote at age 16, was recorded by Don and Dewey in 1958, and later covered by several other artists including The Righteous Brothers. Bono attended Inglewood High School, but did not graduate, opting to drop out so he could begin to pursue a career as a songwriter and performer. He worked at a variety of jobs while trying to break into the music business, including waiter, truck driver, construction laborer, and butcher's helper. Bono began his music career as a songwriter at Specialty Records, where his song "Things You Do to Me" was recorded by Sam Cooke, and went on to work for record producer Phil Spector in the early 1960s as a promotion man, percussionist and "gofer". One of his earliest songwriting efforts, "Needles and Pins" was co-written with Jack Nitzsche, another member of Spector's production team. Later in the same decade, he achieved commercial success with his then-wife Cher in the singing duo Sonny and Cher. Bono wrote, arranged, and produced a number of hit records including the singles "I Got You Babe" and "The Beat Goes On", although Cher received more attention as a performer. He played a major part in Cher's solo recording career, writing and producing singles including "Bang Bang" and "You Better Sit Down Kids". Bono co-wrote "She Said Yeah", covered by The Rolling Stones on their 1965 LP December's Children. His lone hit single as a solo artist, "Laugh at Me," was released in 1965 and peaked at No. 10 on the Billboard Hot 100. In live concerts, Bono would introduce the song by saying "I'd like to sing a medley of my hit." His only other single as a solo artist, "The Revolution Kind," reached No. 70 on the Billboard Hot 100 later that year. His solo album, Inner Views, was released in 1967. 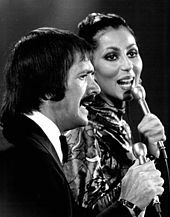 Sonny continued to work with Cher through the early and mid-1970s, starring in a popular television variety show, The Sonny and Cher Comedy Hour, which ran on CBS from 1971 to 1974. From 1976 to 1977, the duo, since divorced, returned to perform together on The Sonny and Cher Show. Their last appearance together was on Late Night with David Letterman on November 13, 1987, on which they sang "I Got You Babe". "What we call a hook hits you, ... then you're almost not writing, lyrics come to you, a sort of magic takes over, and it's not like work at all." -Sonny Bono on songwriting, 1967 Pop Chronicles interview. Bono's acting career included bit parts as a guest performer in such television series as Fantasy Island, Charlie's Angels, The Love Boat, The Six Million Dollar Man and CHiPs. In the 1975 TV movie Murder on Flight 502, where he played Jack Marshall. He appeared in the 1980 miniseries Top of the Hill. He played the role of mad bomber Joe Selucci in Airplane II: The Sequel (1982) and appeared in the horror film Troll (1986). He also portrayed racist entrepreneur Franklin Von Tussle in the John Waters film Hairspray (1988). In Men in Black (1997), Bono is one of several oddball celebrities seen on a wall of video screens that monitor extraterrestrials living among us. He also appeared as the Mayor of Palm Springs (which he actually was at the time) in several episodes of P.S. I Luv U during the 1991–92 TV season, and on Lois & Clark: The New Adventures of Superman (in Season 1, Episode 9, which aired November 21, 1993), in which he played Mayor Frank Berkowitz. He also made a minor appearance as himself in the comedy film First Kid (1996). Bono guest-starred as himself on The Golden Girls episode "Mrs. George Devereaux" (originally broadcast November 17, 1990), in which he vied with Lyle Waggoner for Dorothy's (Bea Arthur) affection in a dream sequence. In Blanche's (Rue McClanahan) dream, her husband is still alive, and Bono uses his power as Mayor of Palm Springs to have Waggoner falsely arrested so he can have Dorothy to himself. Bono entered politics after experiencing great frustration with local government bureaucracy in trying to open a restaurant in Palm Springs, California. Bono placed a successful bid to become the new mayor of Palm Springs. He served four years, from 1988 to 1992. He was instrumental in spearheading the creation of the Palm Springs International Film Festival, which is held each year in Bono's memory. Bono ran for the Republican nomination for United States Senate in 1992, but the nomination went to the more conservative Bruce Herschensohn, and the election to the Democrat Barbara Boxer. Bono and Herschensohn became close friends after the campaign. Bono was elected to the United States House of Representatives in 1994 to represent California's 44th congressional district. He was one of twelve co-sponsors of a House bill extending copyright. Although that bill was never voted on in the Senate, a similar Senate bill was passed after his death and named the Sonny Bono Copyright Term Extension Act in his memory. It is also known (derisively) as the Mickey Mouse Protection Act. He championed the restoration of the Salton Sea, bringing the giant lake's plight to national attention. Speaker of the House Newt Gingrich made a public appearance and speech at the shore of the lake on Bono's behalf. Despite his efforts for the Salton Sea, the League of Conservation Voters (LCV) considers Bono's record on environmental issues to be poor. The LCV  has rated his voting record on such issues at 7%. 100% is a perfect score. You're a celebrity now, ... The rules are different for celebrities. I know it. I've been there. I've been a celebrity. I used to be a bigger celebrity. But let me tell you, you're not being handled right. This is not political news coverage. This is celebrity status. You need handlers. You need to understand what you're doing. You need to understand the attitude of the media toward celebrities. Bono remains the only member of Congress to have scored a number-one pop single on the US Billboard Hot 100 chart. Bono married his first wife, Donna Rankin, on November 3, 1954. Their daughter Christine ("Christy") was born on June 24, 1958. They divorced in 1962. In 1964, Bono married singer and actress Cher. They had one child, Chaz, born March 4, 1969. In 1975 they divorced. Bono then married Susie Coelho on New Year's Eve 1981. They divorced in 1984. He wed Mary Whitaker in 1986 and they had two children, son Chesare Elan on April 25, 1988, and daughter Chianna Maria on February 2, 1991. Bono was named a godparent of Anthony Kiedis, who would go on to become a musical artist with his band, Red Hot Chili Peppers. Sonny was a close friend of Anthony's father, Blackie Dammett, and would often take the boy on weekend trips. Bono was a champion of the Salton Sea in southeastern California, where a park was named in his honor. The 2005 documentary film Plagues & Pleasures on the Salton Sea (narrated by John Waters) features Bono and documented the lives of the inhabitants of Bombay Beach, Niland and Salton City, as well as the ecological issues associated with the Sea. He became interested in Scientology and took Scientology courses partly because of the influence of Mimi Rogers, but stated that he was a Roman Catholic on all official documents, campaign materials and websites. His wife Mary also took Scientology courses. However, after his death, Mary Bono stated that "Sonny did try to break away [from the Church of Scientology] at one point, and they made it very difficult for him." The Church of Scientology said there was no estrangement from Bono. Bono died January 5, 1998 when he hit a tree while skiing at Heavenly Mountain Resort near South Lake Tahoe, California. After Bono's death, Mary Bono said that Sonny had been addicted to prescription drugs (mainly Vicodin and Valium) and that she believed her husband's drug use caused the accident. However no drugs or alcohol were found in his body on autopsy. At Mary's request Cher gave a eulogy at Sonny's funeral. He was buried at Desert Memorial Park in Cathedral City, California. The epitaph on Bono's headstone reads AND THE BEAT GOES ON. Mary was elected to fill the remainder of her husband's congressional term. She was elected in her own right seven subsequent times before being defeated in the election of 2012. It has also been claimed that Sonny was murdered on orders of drug and weapons dealers who feared he was going to expose them. Sonny Bono Memorial Park, a small park in Washington, DC. ^ "U.S. Copyright Office: Annual Report 2002: Litigation". Copyright.gov. Retrieved 2011-01-21. ^ a b c d Larocque, Jason (2013). Cher: You Haven't Seen The Last of Me. Charlotte, NC: Baker & Taylor. p. 35. ISBN 978-1-300-88858-1. ^ "Sonny Bono Biography". Yahoo! Movies. Archived from the original on February 17, 2010. Retrieved October 8, 2009. ^ Kephart, Robert (February 16, 2016). "Palm Springs Remembers Sonny Bono -- February 16, 1935 - January 5, 1998". I Love Palm Springs!. Palm Springs, CA: Palm Springs Guru. ^ Morris, Chris; Holland, Bill (January 17, 1998). "Bono Recalled as Politician and Performer". Billboard. New York, NY. p. 16. ^ Hodenfield, Chris (May 24, 1973). "As Bare As You Dare With Sonny and Cher". Rolling Stone. New York, NY. ^ Yates, Nona (January 7, 1998). "Sonny Bono, a Chronology". Los Angeles Times. Retrieved October 8, 2009. ^ Bego, Mark (2001). Cher: If You Believe. Lanham, MD: Taylor Trade Publishing. p. 21. ISBN 978-1-58979-135-0. ^ a b Gilliland, John (1969). "Show 44 - Revolt of the Fat Angel: Some samples of the Los Angeles sound. [Part 4]" (audio). Pop Chronicles. University of North Texas Libraries. Track 1. ^ "Sonny Bono – Inner Views – from Rhino Handmade". Rhinohandmade.com. Retrieved 2015-02-10. (Subscription required (help)). ^ Johnson, Gary. "Michigan Rock and Roll Legends - SONNY BONO". www.michiganrockandrolllegends.com. ^ "Bono, Sonny – Biographical Information". Bioguide.congress.gov. Retrieved October 8, 2009. ^ "Bill Summary & Status – 105th Congress (1997–1998) – H.R.2589 – THOMAS (Library of Congress)". Thomas.loc.gov. March 26, 1998. Retrieved April 25, 2012. ^ "Salton Sea rescue to be named for Sonny Bono". CNN. January 16, 1998. ^ "Rewinding the Charts: Fifty Years Ago, Sonny & Cher 'Got' to No. 1". Billboard. Retrieved December 2, 2017. ^ "Anthony Kiedis". Angelfire. Retrieved April 25, 2012. ^ "Kiedis' Bedroom Joy With Cher". Contactmusic.com. October 11, 2004. Retrieved April 25, 2012. ^ "Plagues & Pleasures on the Salton Sea". Saltonseadoc.com. Retrieved October 8, 2009. ^ "Palm Springs Walk of Stars by date dedicated" (PDF). Archived from the original (PDF) on October 13, 2012. ^ Wright, Lawrence (November 5, 2013). Going Clear: Scientology, Hollywood, and the prison of belief. New York City: Vintage. pp. 249–50. ISBN 978-0307745309. ^ Pareene, Alex (February 10, 2011). "The Cult of Scientology's friends in Washington". Salon. Retrieved May 17, 2015. ^ Bardach, Ann (August 1999). "Proud Mary Bono". George. Retrieved May 17, 2015. ^ Babington, Charles (July 15, 1999). "Bono Not Receptive to Scientologists". The Washington Post. p. A5. Retrieved September 24, 2017. ^ a b Claiborne, William (January 7, 1998). "Sonny Bono Is Killed in Ski Crash". The Washington Post. ^ "Sonny Bono Killed in Skiing Accident". CNN. January 6, 1998. Retrieved September 27, 2016. ^ Brooks, Patricia; Brooks, Jonathan (2006). "Chapter 8: East L.A. and the Desert". Laid to Rest in California: a guide to the cemeteries and grave sites of the rich and famous. Guilford, CT: Globe Pequot Press. pp. 239–40. ISBN 978-0762741014. ^ Lochhead, Carolyn (November 7, 2012). "Mary Bono Mack defeated in Palm Springs upset". San Francisco Chronicle. Retrieved 2012-11-07. 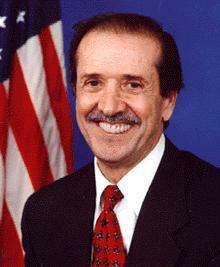 ^ "Hitmen "clubbed" Sonny Bono to death, FBI claims". Wikimedia Commons has media related to Sonny Bono.